Emily Readett-Bayley’s designs are inspired by the abundance of beautiful, natural resources found in Indonesia but she has always taken care to source from a sustainable supply. 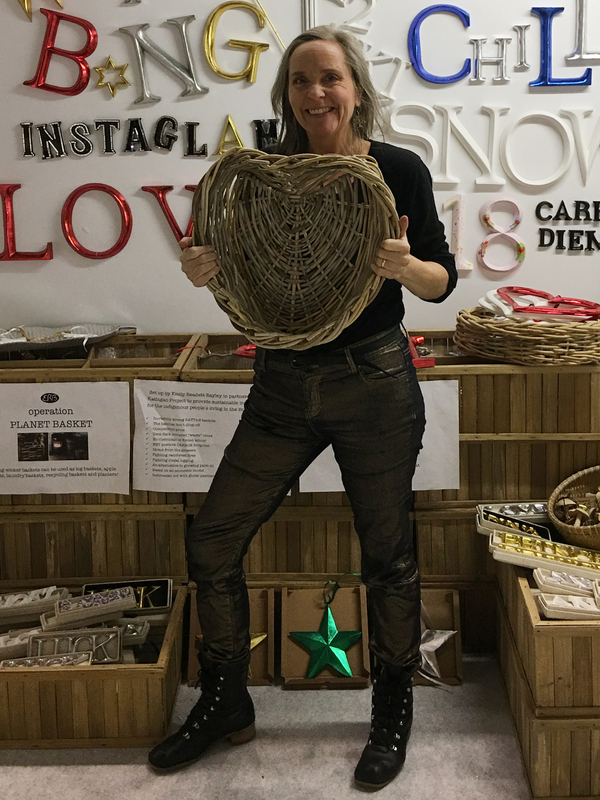 She uses fast growing albizia wood, salvaged hardwood timber, coconut wood and shells, recycled glass, agricultural bi-products and non-timber products including bamboo, rattan, reeds and feathers. Emily works directly with the craftspeople and there are no middle men involved . Her Balinese husband co-ordinates production in Bali and in Borneo and Sumatra Emily is working alongside the local teams who manage the forest restoration concessions. The original POSH Graffiti wooden letters have been made by the same village rice farming community in Bali for 15 years. Many farmers are excellent wood carvers and use this important secondary business to suppliment their income and so sustain their unique agricultural system known as Subak which is recognised by UNESCO. The farmers plant fast growing albizia trees around their rice fields to provide wood. For many years Emily has pioneered the concept of stylish design and exceptional craftsmanship with an ethical policy. Emily is now taking take this idea even further by linking artisan craft with sustainable agroforestry with the aim of preserving the heritage of the indigenous people who hold the key to symbiotic living in and around the rainforest. May 1997 Wallpaper magazine prints it’s second edition with a cover reading Bam-boom! 1998 Emily Readett-Bayley Ltd is incorporated and selected to exhibit as part of the Scenes d’ Interieur 10th Anniversary at Maison et Objet in Paris. Sells to stores worldwide. 1999 – 2011 Exhibited at trade shows in London, Birmingham, Paris, Tokyo and Frankfurt and continues to sell her designs world wide and ERB has press coverage in a wide variety of national and international interior design magazines and newspaper colour supplements. 2006 Exhibits reclaimed teak garden furniture at Chelsea Flower Show and continues to do so for 6 years . 2006 Launches ecommerce website POSH Graffiti.com with her sister Lucy selling her original POSH Graffiti wooden lettering, decorations and furniture under the POSH Salavage brand name. 2011 ERB Exhibits as part of “Britain is Great and Green” at Milan Fashion week. 2012 Emily visits The Katingan Project an important eco system restoration project covering 200 000 hectares of critically endangered lowland peat rainforest in central Kalimantan. This gives her the idea of setting up rattan basket and furniture workshops to supply the international market direct and add value to the wild rattan grown sustainably in forest gardens by the local Dayak communities. The rattan is usually sold as a raw material to middle men for low prices and they sell it on to factories in Java or China. 2013 Half of the basket shipment is sold to a film production company at Pinewood Studios who are filming the new Star Wars movie. 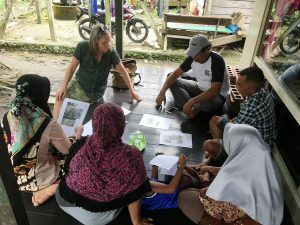 2016 Emily launches Operation Planet Basket an initiative to develop sustainable agroforestry and the associated artisan crafts and market access for the marginalised communities living in an around threatend eco systems in Indonesia. 2017 POSH Graffiti is incorporated Jason Weatherbed takes over the running of POSH Graffiti.com. Emily Readett-Bayley Ltd continues to supply the original handmade POSH Graffiti to the company. 2018 ERB is invited to evaluate the possibilty of supplying sustainable rattan and agroforestry products from the Katingan Mentaya Project into the UK garden centre market.